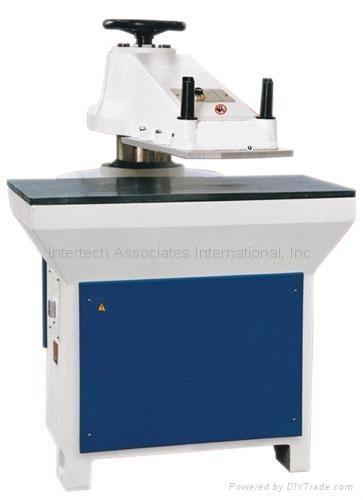 Fabric Cutting Machine - Intertech Associates International, Inc.
and chemical fibre etc. With molding cutter. 1．The operation is labor-saving and simple, with low malfunction, strong cutting power and high cutting speed. guarantee the absolutely same cutting depth of each cutting position. size error between the uppermost layer and lowermost layer of the cutting material. synthetic materials in one layer or numerous layers. sides.The good guide effect ensures the parallelism of upper and lower working sides. 2．The double-hand operation ensures the operators safety. out cutter mold and ensures the safety. 5．Suitable for laying-off of wide and multi-layer materials. 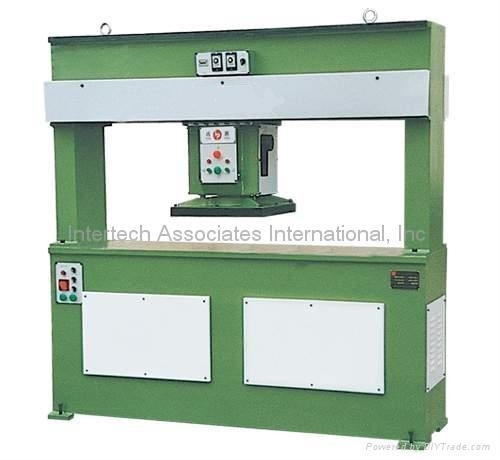 This machine is mainly suitable for cutting varieties of leather rubber,plastic,fabric,etc with a blade of fixed shape. b.The puncher pin can move left and right automatically to achieve convenient operation and save working time. c.An automatic feeding equipment can be added optionally to improve work efficiency. two-section cutting,down in the first section,pressure concentrated in the second section to cut with high pressures. With this method,the blade of cut articles is even and the life is prolonged with power being saved. Peculiar mill mould configuration, with the cutting mill and height, the process regulation is made simple and proper. Multi-tube cooler is equipped, ensuring the oil temperature remains stable. 1.Computer control system and screen-touching display make operation easy.quick and exact. 2.Bi-cylinder and the structure of four-column automatic balancing rod guarantee the same depth of each cut position. 3.It can support single-side or bi-side automatic feed attachment and raise the working efficent of the whole machine by two or three times. 4.When cutting board presses down and touches cutter. it slows down to cut automatically . which can avoid error between top and the bottom pf the cut material. 5. The special designed structure can match the cutter and cut height to make stroke adjust easy and exact. 6. Center Automatic Lubrication System can guarantee the precision and can raise abrasive resistance. The machine is applicable for cutting of leather, rubber, plastic, paperboard, cloth, foam, nylon, synthetic leather and PVC plate etc. materials by die cutter in leather processing, luggage and baggage, automobile decoration, shoemaking and plastic rubber etc. Industries. 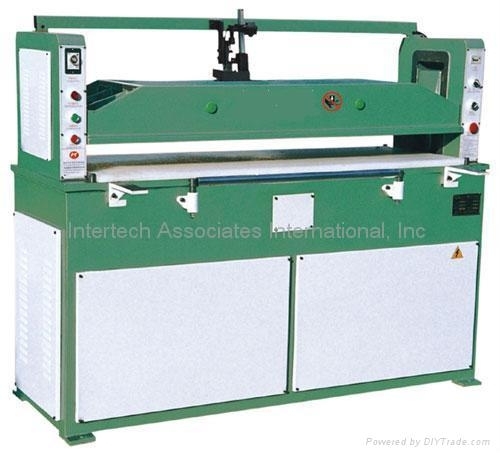 1．The double oil cylinder, precise four-column automatic balancing connection rod mechanism can guarantee all cutting positions have the same depth. 2．The upper pressing board can move forward and backward so that the operation visual ield of operator is the best and the labor intensity is greatly reduced. 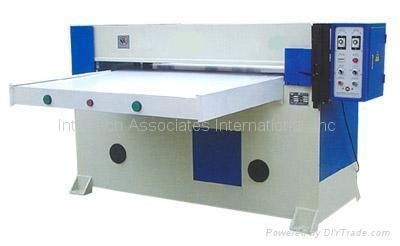 3．When cutting, after feeding material and arranging die cutter, the upper pressing board will move forward, descend, punch, ascend and automatically move backward. All the actions are completed without a letup, which has greatly increased work efficiency. 4．During the cutting operation, the photoelectric tube control is adopted with the most safe　operation. 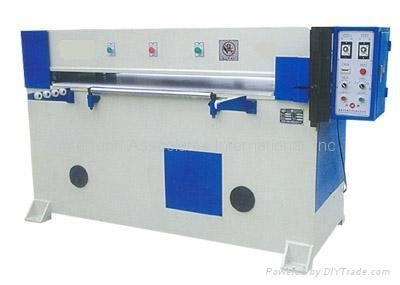 1.TheCutting Machine is applicable for whole-broken or semi-broken operation of various nonmetal slices materials bydie cutter.for example :such industries as plastics packing,pearl conton packing,rubber and printing etc. 2.Microcomputer controlled,with simple, prompt and accurate operation. 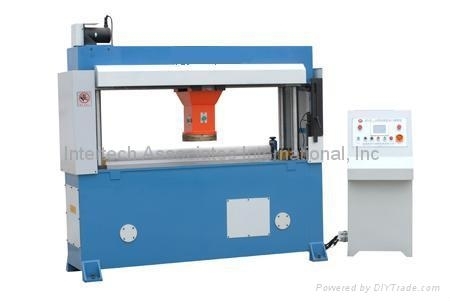 3.The main machine adopts double oil cylinder,double-crank connecting rod balancing,four-column precise guiding mechanism,which can guarantee that the cutting depth at every cutting position is same. 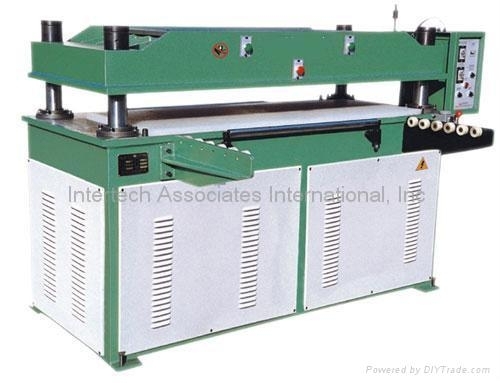 4.The pressing board carries out slow cutting when it presses downward to contact the die cutter ,which can make that there is no size error between the uppermost layer and lower most layer of cut materials. 5.The central oil supply automatic lubricating system guarantees the service life and precision of machine. 6.single-side or double-side automatic feeeding system can be allocated to enhance the production efficiency of machine twice or thrice. 7.Cutting board micro-movement device can be allocated to evenly consume the cutting board and save cost. 8.Die cutter pneumatic clamp device can be allocated to make the replacement of die cutter convenient and prompt .optional:1,single-side and double-side automatic feeding systems;2,Cutting board micro-movement device,3,Die cutter pneumatic clamp device.